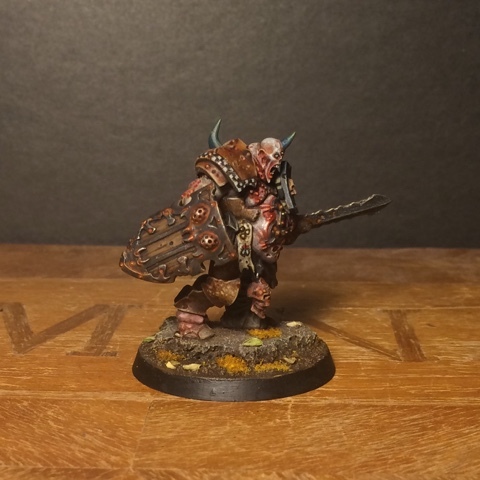 The fourth Blightking is done. This one might very well be my favourite to date - there's something nasty and ferocious about him I'm quite fond of. And here you see him next to his comrades. Four done - one to go! These are so good mate. I can't gush enough over how much I love seeing your stuff pop up in the feed. I'm always sure to get a gem, either the interest of seeing the naked plastic construct or ones like this in all their glory. Great stuff. Wow! Thank you for your kind words Muppet! I love the irritated skin where it looks like it's been rubbed raw, like on his elbows. Cheers - I always try to give spots like the elbows, the knuckles, ears and nose a thin red wash. Details like that make the mini look more alive I find. Superb job, great to see how well they go together. Thank you Stuart. Washes really are key to get all those hue variations on the skin and armour. Bloody gorgeous. This one in particular. Great details and sublime skin technique! 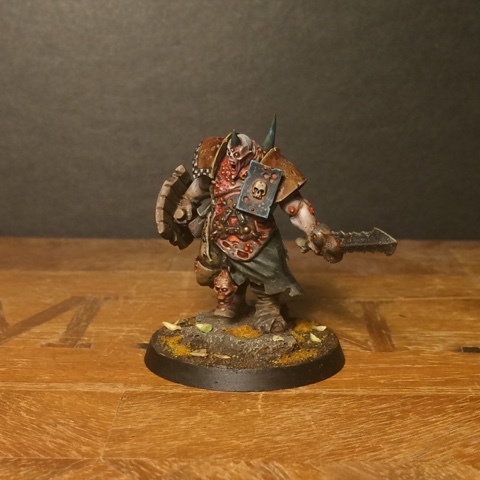 Im definitely digging these blight kings they are a great addition to your nurgle warband. Quick question, from what I can tell the Path to glory looks like a guide to build a small army as opposed to a warband (necromunda/mordheim size) am I correct in this presumption? I love the Realms of chaos books and design tables would you say this is on par? You're quite right. It's more in the vein of the RoC warbands - you end up with a small army of about 25-30 models. We also shaved off one choice to make our warbands slightly smaller. 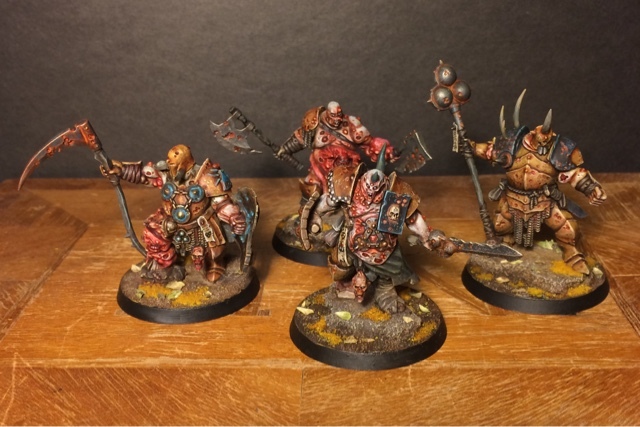 I have seen a lot of great Blightkings since the box came out, but these ones must be the best! Especially the last one. I really like the small details like the chess-pattern on the shoulder pad, and the little free-hand fly symbol on the parchment. I think it's the way his eyes and teeth glow out of that dreary face.... Makes me remember Adrian Smith's nurgling illustrations where their eyes did similar. Makes them all the more daemonic. And only one more? Surely you mean, three more; so the unit is at a perfect SEVEN??? Haha. According to the the Path to Glory rules I only get five. Thems the rules. Some great little details on this one. Love the little fly symbol on the parchment hanging from his side. Last minute addition that one. Fan vad snyggt. And so quickly painted :) amazing! Wow ! Awesome probaly your finest work till now ! Smells like an other Blanchitsu ticket ! Great work again! I really like the colour palette you're working with on your Nurgle miniatures. Thanks! I tried to stay away from the standard green and do something earthier. 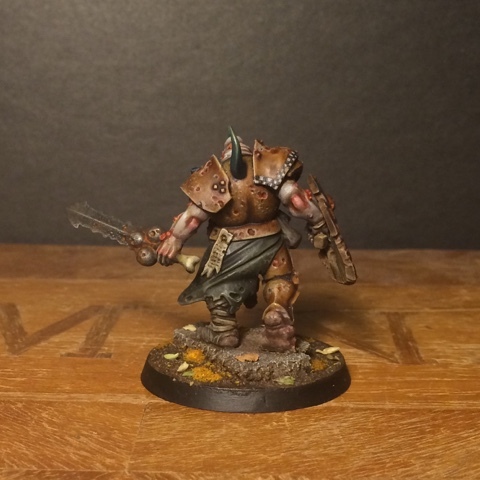 Nurgle feels like autumn. 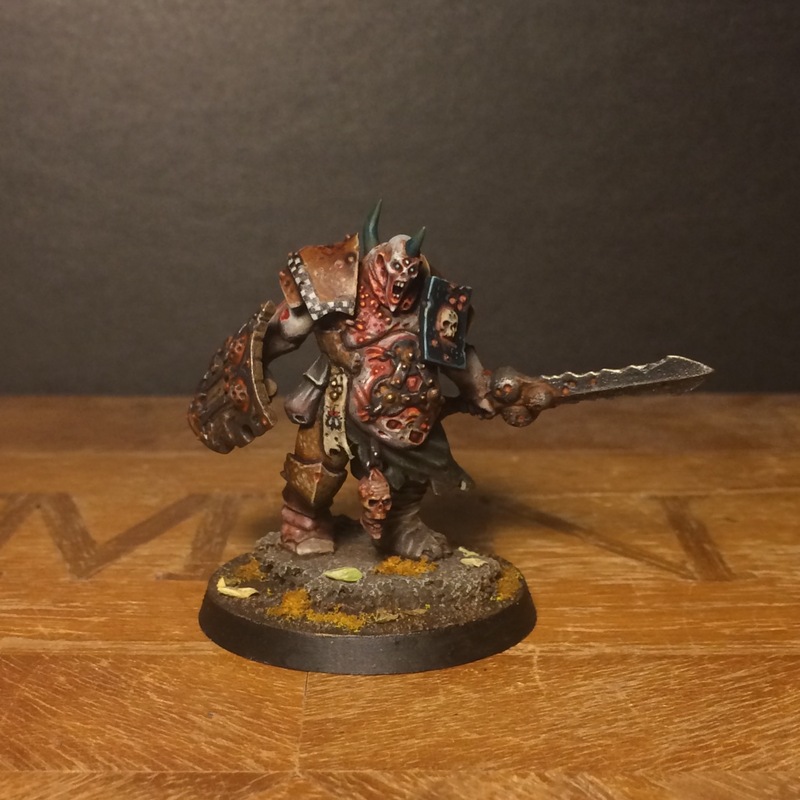 This is easily one of your best paintjobs so far -- and just when I thought your recipe for distressed Nurglite skin couldn't get any more awesome -- NUTS! What really gets me about the model is that the conversion itself, while nice enough, didn't stand out as something spectacular, but the piantjob has really transformed this model into an absolute standout piece. Brilliant! Now what have I gotten myself into...?